Music Sales America. Bluegrass and Learn To Play. Instructional book (softcover) and examples CD. 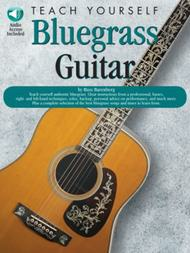 With guitar tablature, chord names, guitar chord chart, instructional text and guitar notation legend. 64 pages. Oak Publications #MUSOK64990. Published by Oak Publications (HL.14032983). 30 of 74 people found this review helpful.